Dorothy Straughter depicts lynching scenes and images associated with negrobilia using quilts hung throughout the exhibit. Addressing racism in any form has never been an easy conversation to have, and it certainly has never been a pretty one either, but an art exhibit in one of the most diverse neighborhoods of Chicago, Beverly, is using art to spark new discussions around the topic. The Beverly Area Arts Alliance (The Alliance), a group that works with communities to promote the arts, is straying from its more conventional content to promote artists with the ambition to spur community dialogue around racial disparity, a prevalent topic in both the immediate neighborhood of Beverly and to the nation as whole. Borrowing language from “Freedom is a Constant Struggle” written by political activist Angela Davis, the exhibit dubbed “A Constant Struggle” features work from three Chicago artists, each exploring aspects of institutional racism through various mediums ranging from quilt to ceramic. The exhibit’s opening reception begins at 2 p.m. April 23, in the Beverly Arts Center, 2407 W. 111th St.
Sal Campbell, lead curator and co-founder of The Alliance, said the content of the exhibit addresses the occasional racial tensions that arise in the Beverly and neighboring Mount Greenwood neighborhoods. Campbell added that she was sure that some of the exhibit attendees will be uncomfortable viewing the content, but she hopes they will be willing to consider different viewpoints and ideas about the work. One of three participating artists in the exhibit and long-time Beverly resident, Jomo Cheatham, will be displaying a model church, covered in a stereotypical picnic cloth titled “Structure N° 1.” The piece sits atop a number of mason jars filled with items one would expect to find on the ground after a picnic, such as sand, charcoal and chicken bones. Cheatham said the jars and the picnic cloth play into the historical relation between picnics and the lynching of African-American individuals. Cheatham added that the church was chosen as the focal point of the piece because it is one of the institutions that passively stood by during the unconstitutional lynching of United States civilians in the early 20th century. Cheatham plans to create additional structures modelled after other institutions that have also historically stood idle during the unlawful lynching of primarily African-Americans. Cheatham said while connections can be made between his work and the Beverly and Mount Greenwood areas, he aims to have his work viewed through a national scope. He added that if possible, he would like the discussions spawning from his work to turn into legislature that would compensate the families of historic lynching victims since losing a family member in the early 20th century greatly reduced people’s opportunities for upward mobility. Throughout the “Constant Struggle” exhibit, Dorothy Straughter’s quilts depict scenes from historically prevalent situations in African-American culture including The Great Migration and The Underground Railroad. Participating artists Dorothy Straughter and Dawn Liddicoatt will also be displaying work that focuses on racial disparity. 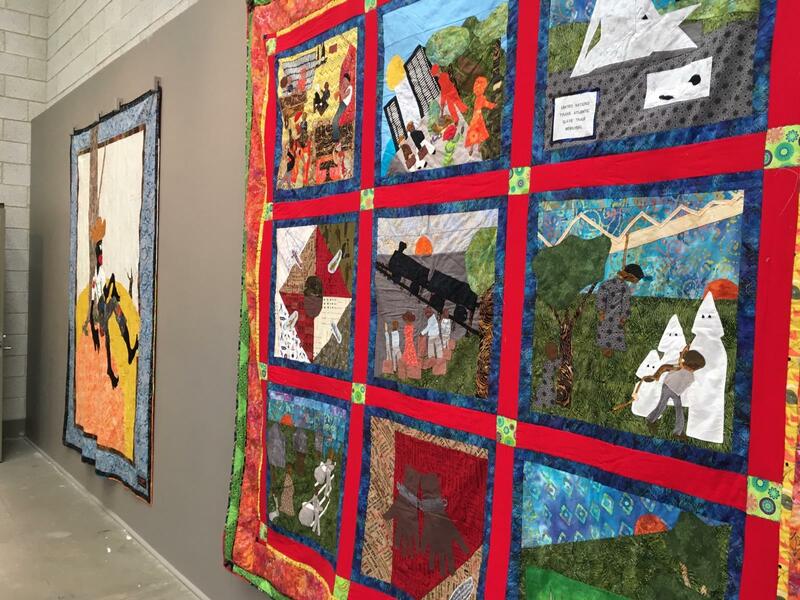 Straughter will be displaying a series of quilts which incorporate lynching scenes as well as references to the Great Migration and the Underground Railroad. Liddicoatt will be displaying her ceramic vessels, each of which represent a Chicago different with violent reputations. 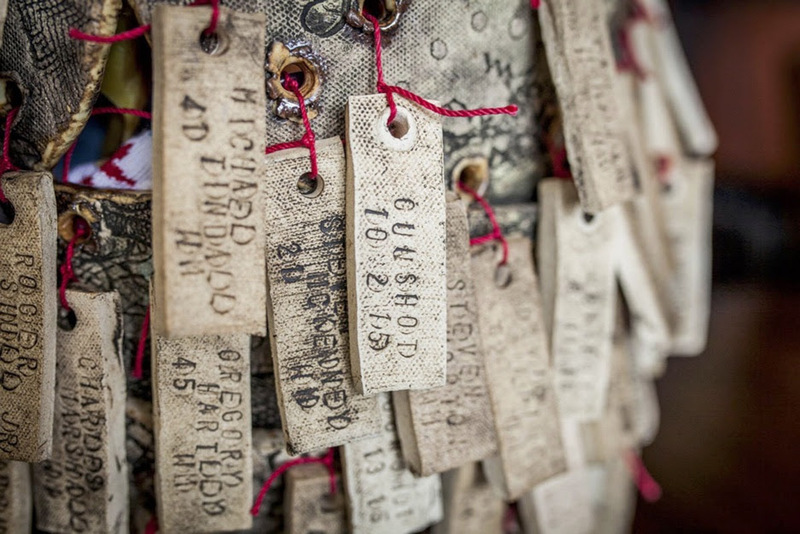 Liddicoatt uses holes in her pottery to depict the number of shootings and strings dog tags through them that each describe the name, age, gender, race and date of those killed. Alongside the exhibit but not officially part of the show, Englewood native Tonika Johnson will also have work featured. Johnson has developed a reputation for herself throughout Chicago by using photos to portray her hometown neighborhood, often associated with crime and violence, in a positive light. Monica Wilczak, co-founder of The Alliance, said when her group puts on a show they see it as an opportunity to spark conversation and expose people to new ideas and perspectives. Wilczak compared the potentially controversial work of the exhibit to historic art movements such as expressionism or surrealism, which were initially highly disputed but are now artistic staples. Wilczak added that her and other members of The Alliance see the work as a positive influence on the community and if there are people who disagree, she hopes they come to learn more about the work and speak with the artists about their reasons for creating it. During the April 23 opening, artists will speak about their work as well as the ideas associated behind them, and an informal open mic will be open for those who wish to speak about the work or ask questions. The opening will also feature live blues by Ms. Reece and the Reece’s Pieces Band, a special performance of Strange Fruit by Siobhan McKissic, and a mead tasting from Wild Blossom Meadery. On May 18, the exhibit will also undergo a change as some of Straughter’s quilts, which were too large to have both sides displayed, will be flipped, transforming the content of the exhibit. An official open mic will be available and Campbell said she is working to arrange poets and other performers to make an appearance at the event. Cheatham said he wanted people to know that his work and the work in the exhibit was not created to be inflammatory and provocative but to start valuable discussions that could lead to legitimate change.